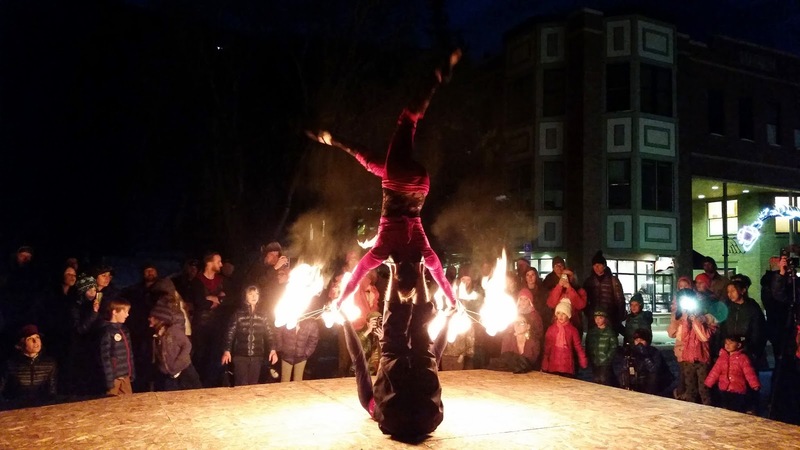 Playing with Fire, Reece, and Luca on Telluride`s Main St.
dance/gymnastics which reminded me of a Cirque du Soleil performance...this was a bit smaller production...but the night time shows worked for the fans. Especially the little ones. can I throw some wood on it too? How can Fire Tender Boy say no...especially to Julie McA`s two darlings, Reece and Luca. Luca can`t be more than 2 or maybe 3...Ms. Julie McAfee left my Telluride Realty firm after she produced Luca...intensely darling girls, both. Reece will be a handsome young dude...watch out. A good show for the fans. And it really was for me too, especially because of Luca.